Noticed some strange goings on here, anybody else? Expensive flashy cards parked up outside the shop on a regular basis. Gangs of people there everynight playing loud music until the early hours. Wondering if anyone else had picked up on it recently? All I have noticed is that their bloody PayPoint machine for electricity top-up has been on the blink for months now! They are well laid-back about it, whenever I ask if it's fixed. I admire their chilled-out approach to retailing. MagmaTimes wrote: All I have noticed is that their bloody PayPoint machine for electricity top-up has been on the blink for months now! Centre News next door has Paypoint I believe if that helps. Where *is* Payless? I looked up and down most of the high street the other day when I went along it, but didn't spot it. I have to say, those symptoms don't sound good, based on my experience elsewhere. Perhaps a word with yer friendly neighbourhood police person, if such exists? alywin wrote: Where *is* Payless? I looked up and down most of the high street the other day when I went along it, but didn't spot it. Is there a facepalm emoticon - I could use that !! 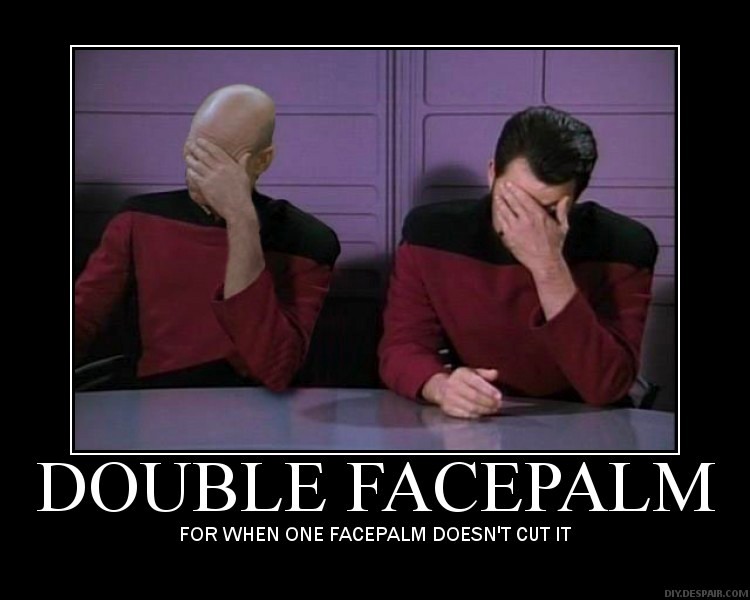 JGD wrote: Is there a facepalm emoticon - I could use that !! Sadly not an emoticon, but stacks of images that suffice. Oddly it was closed most of the day today (Sat) and opened again in the late evening. Parker1970 wrote: Oddly it was closed most of the day today (Sat) and opened again in the late evening. It has been like that for the past few days. Then they will arrive in a white beamer at around 11pm, play loud music, shout and smoke outside. Literally almost nothing on the shelves now, wtf is going on? It could be entirely innocent, Centre News next door now has a liquor licence and is open til 11pm so maybe Payless have ditched food etc and just sell bozze and ciggies when Centre news is closed.. but I do suspect something more nefarious. The smell of their smoking is most of the time not a tobacco smell if you catch my drift. I've spoken to Centre News staff and they are absolutely fuming about it. Say it's been terrible for business. I witnessed and photographed a bizarre incident at 5.45pm on 24th November. I was waiting at the pedestrian crossing when a white Audi swerved in and honked me repeatedly and aggressively to get out of the way. He then mounted the drop-kerb there and drove along the pavement scattering everybody . Several of us remonstrated with the driver and his friend including the Bookshop people (as he had just driven over their forecourt). He explained he had a 'delivery' for Payless. But we were having nothing of it. He gave up and the picture was taken as he reversed back to the pedestrian crossing - which was his only possible exit - and then reversed into the road as unexpectant traffic came blindly over the hump bridge. Uncomfortable and dangerous for all those concerned. And if any of Her Majesties Constables are reading this - some 'words of advice' to the Registered Keeper would be appreciated for driiving over our new expensive pavements and espencially the pavement lights which might not be designed to carry such a load. Wow, that is terrible behaviour. Well done for capturing a picture of them doing this. Reading up it seems to make for a rather curious situation. Certainly hope the neighbourhood team would be willing to do something. Great stuff for taking a pic of this idiot, and his reg is clearly visible if our "community" police are interested. I've noticed similar behaviour from other "corner shops" recently: it may be that they're opening when demand tends to be highest and closing at other times, either for economic reasons or because of staffing problems. It doesn't automatically mean something nefarious is going on. It's also a bit worrying that if you search that reg (YA64 JKS) on the government website to check tax and mot, it shows up as not a valid registration, so I've either misread it or those are fake plates. Either way, definitely needs reporting to the local plod. Looks like JXS to me. Can’t quite understand the reasoning behind stuff like this. At all. JMLF wrote: Looks like JXS to me. Can’t quite understand the reasoning behind stuff like this. At all. Ah my mistake you're bang on. Should be easy enough to track the owner then. Ridiculous and unsafe behaviour.